Congratulations to "Sami" and "Judi L", the winners in Kendra's giveaway. Thank you to all who participated. I turned in manuscript number three in the Bone Secrets Novels to my editor this week, and she is expecting book number four in six months. I have no idea what I’m going to write. I love high concept. My first book, HIDDEN, was about a woman hounded by a serial killer for the second time, CHILLED was about a federal marshal transport plane crashing in the wilderness, and the third, BURIED, will be about a school bus full of children who simply vanish. Each time, the basic concept of the book flooded my brain and didn’t let go. I’m still waiting for that to occur this time. Am I worried the idea won’t come? Not at all. I have full faith in the creative process that the right idea will appear when I need it. This also happens during the writing process of a novel. I’ll have no idea how to write myself out of a corner, but if I simply keep pushing and typing the solution presents itself. My editor has asked me to return to my forensics specialist in HIDDEN. We’ve discussed using this character to create an ongoing series similar to concepts by Kathy Reichs and Patricia Cornwell. Just typing the names of those fabulous authors intimidates me. But I love their books. I’m inspired by the challenge my editor has given me and I want to pursue it. Do you like books with recurring main characters? Who is your favorite? One that stands out for me is JD Robb’s Eve Dallas. Unbelievably, her 35th book comes out next month. And when do you tire of reading about the same person? Kendra will be giving a copy of HIDDEN to one lucky commenter and a copy of CHILLED to another lucky commenter! Giveaway ends 11:59pm EST Aug. 19th. Please supply your email in the post. You may use spaces or full text for security. (ex. jsmith at gmail dot com) If you do not wish to supply your email, or have trouble posting, please email maureen@justromanticsuspense.com with a subject title of JRS GIVEAWAY to be entered in the current giveaway. Giveaway is for residents of the US and CANADA only. I would love to see Lacey and Jack return in another book! Hi Angelle! Nice to see you in another place! I LOVE Lisa Jackson and look to her writing style and books for inspiration. She also lives about 10 miles from me! I was hooked on Bentz the first time I read about him. Unbelievably I think I've only read one James Patterson book. Lol, I'm trusting it will. Once the kids are back in school, I'll be able to think about it more. Yes, I like recurring characters and that's why cozies can be so much fun. Some other favorites include: Vince Flynn - Mitch Rapp; Brad Parks - Carter Ross; William Kent Krueger - Cork O'Connor. That's what I've been doing. My main character in CHILLED was a very minor character in HIDDEN. The main character in BURIED had a large role as a secondary character in HIDDEN. I find it's easier to write about them because I already know them! No need to enter me as I have already both of these books. I just wanted to tell you how fantastic they both were. Can't wait for the next one! I love books with reccuring characters. My favorite has definitely got to be the Kathleen Turner series by Tiffany A Snow. That's what I love to hear!! I've seen the Kathleen Turner series, the covers have caught my eye a few times. I'll have to check them out. 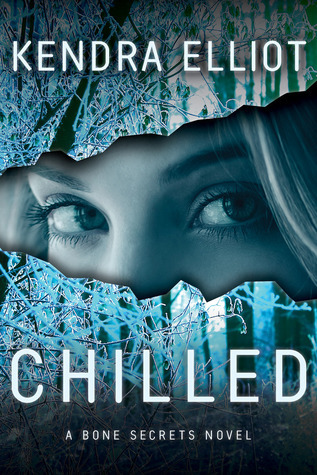 Love the cover for CHILLED... the coloring is wonderful! As for reading about the same character over & over again... it has to hold my interest which JD Robb's In Death series and Eve Dallas do for me. Each book has a great case... does not drag on. I have read a few series that seem to drag things out and I lose interest. They leave too much open for me to enjoy. Then there are other series that have new characters in each book, but return with characters in the past to connect them... those are ones that have held my attention too... example: Catherine Coulter's FBI series. Hi Colleen. Yes, I think Nora does a great job keeping her In Death series fresh. I'd say practically unparalleled. I've read several of Coulter's FBI series, too, and really enjoy them. I was just looking at Tess Gerritsen's Rizzoli and Isles series and realized I've missed one. I really admire her writing. Thank you, Jane. And of course Agatha Christie! I've been reading the In Death series since the first one, Naked In Death was published and can't wait to read #35. Not enough time to list all the series I follow - what keeps me reading is the growth and changes the characters go through and how they adapt to changes/challenges in their life. Love the Covers and I also love your two books. This would definitely be a great series. So much room for the characters to grow. Thank you, Kai. I love the covers, too. My publisher really worked with me to get them to where we were both happy. I like recurring characters in books. These books sound good. Hi Toni! Thanks for stopping by. Toni and I share the same fabulous publisher. I love returning characters in books. Some of my favorites are Lisa Gardner, Tess Gerritsen and Karin Slaughter. I have faith that the next inspiration will strike you right out of the blue. I would love to win a copy of one of your books. Judi, we share favorite authors! I plan to read some Tess tonight, looking for inspiration. I've read all of Allison's books since she was first published and is one of my favorite writers. She's great with ongoing characters. I agree it's a bummer. :( Sorry, Vicki. Thanks, Erin. I hope you enjoy the books! That's exactly how I am about papers-- I try to start them weeks in advance, but inspiration never strikes until the night before they're due! Don't know if it's the caffeine or the sleeplessness that goes along with finishing them (or the relief that I'll have something to turn in), but I always think they're bloody brilliant when they're done :P.
I'm a big fan of series with recurring characters-- with a couple of caveats. First, I have to enjoy the characters from the first book and be emotionally invested in them enough to want to keep following them over many books. There are definitely some series out there where I've been lukewarm about the H/h and only been able to read a couple of books. Second, the author has to keep the series & the characters fresh so that it doesn't just drag on and on. [I'm the same way with the little telly I watch: the moment the series starts dragging, I stop watching]. And each book has to feel like a complete story on its own! As most everyone has already mentioned, JD Robb is the master of this with her In Death series... albeit, admittedly, I've fallen waaaaay behind! I also love Allison Brennan's Lucy Kincaid series, Marie Force's Fatal series, anything Lisa Jackson, Lisa Gardner.... okay, I could on for aeons, so I'll just stop. Hi Cris. I have an epic TBR pile, too. And I'm so with you about giving up on a series when it starts to drag. There's a lot of other books/TV shows/series that do it right, so there's always something else to try. Competition for our attention is stiff and easy for an author to lose. I really enjoy recurring characters, even if they just appear in small roles. I have recently discovered series by Laura Griffen (Tracers) and Terry Odell (Blackthorne Inc) through this site. I look forward to reading your books as well! Thanks for the chance at the giveaways! Oh yes, recurring characters are great. Please enter me in your draw. I would enjoy reading your books. I really like when authors give characters cameos. I've recently discovered Pamela Clare's I-Team series and my favorite parts of the books is getting to see what has happened in the lives of character from the books that precede the one I'm reading. I really enjoyed your books and would love to see some of these characters again. I enjoy recurring characters. My favorites are the JD Robb series, Marcie Force's Fatal series and Robyn Carr's Virgin River Series. I love watching the characters grow and love reading about the other people in their lives.